Scandinavian - The North of Europe Steam Navigation Company. Built by: Thos. Wingate & Co., Whiteinch. Machinery: Built by Wingate & Co. Steam simple 2 cly. 100 hp. 1 Screw. Registered: 15th May 1853 in Hull by C. H. Wilson. History: Built for Thos. Wilson, Sons & Co, Hull. 5th September 1852. Left Glasgow for Hull to be completed. 9th September 1852. Arrived at Hull to be completed. 26th November 1852. An accident occurred in the morning on the Humber, by the upsetting of a boat and four poor fellows drowned. About seven o’clock in the morning a boat put off from the east pier, having seven persons on board, their object being to reach the ‘Scandinavian’ steamer, from Gothenburg, which was lying out in the roads, having just arrived, bringing the survivors of the crew of the steam-ship ‘Victoria’. When they had got within fifty or sixty yards of the ‘Scandinavian’ the bow-sprit of a sea sloop lying in the roads caught the mast and capsized her in a moment, precipitating all in her into the water, and before assistance could be procured four of the poor fellows were drowned. 21st November 1853. Arrived at Hull. 16th March 1854. Sold and registered by Wm. S. Andrews, for The North of Europe Steam Navigation Co. Lowestoft. 27th January 1854. Arrived at Lowestoft from London for repairs. December 1856. The reported loss in the papers, we are authorised to say is totally unfounded. 4th December 1856. Arrived at Christiansand with her decks swept clean, due to the bad weather. 15th May 1857. Arrived at Lowestoft from London and docked.br> 26th May 1857. Taken out of dock, Captain Fairburn, and coaled. 27th May 1857. Sailed from Lowestoft for Hull. 16th August 1857. Run into the barque ‘Carl August’ near the mouth of the Humber, which later sunk. 24th November 1857. Arrived at Hull from Gothenburg during a very severe gale. 1858. Owned by Thos. Wilson, Sons & Co, Hull. 28th February 1859. The inquiry on the collision with the ‘Carl August’ was held with the outcome that there wasn’t a good look-out on the steamer and was going at a dangerous speed. 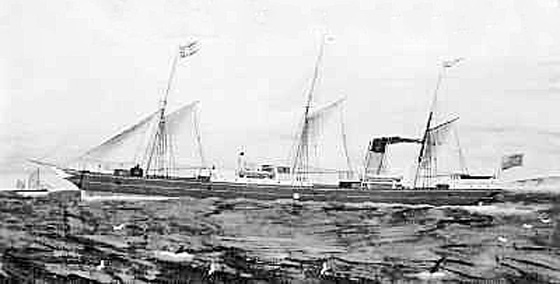 No blame was attached to the ‘Carl August’. After the company went into liquidation there was still an outstand claimed for the cargo of £6,575 . 5s . 7d. 1870. Owned by William Eagle Bott, London. Re-engined by C. & W. Earle & Co, Hull. Compound C2cyl. 98hp. Lengthened by Denny Bros at Whiteinch, Tonnage 608g 472n. 213’ 5” x 26’ 8” x 13’ 9”. Renamed ‘TASSO’. 1872. Owned by Thos. Wilson, Sons & Co, Hull. 14th March 1886. Sailed from Bergen for Hull. Captain Chambers. 15th March 1886. Wrecked in the entrance of Bommel Fjord, Bergen on voyage from Trondheim , via Bergen to Hull.